The Prisoner Hunger Strike Solidarity coalition (PHSS)- originating in the San Francisco Bay Area and made up of grassroots organizations, family members, formerly incarcerated people, lawyers, and individuals- formed in 2011 to amplify the voices of CA prisoners on hunger strike striving to achieve their Five Core Human Rights Demands. The coalition continues to work in solidarity with CA prisoners and their families to amplify prisoners’ voices and end the torture that is solitary confinement. 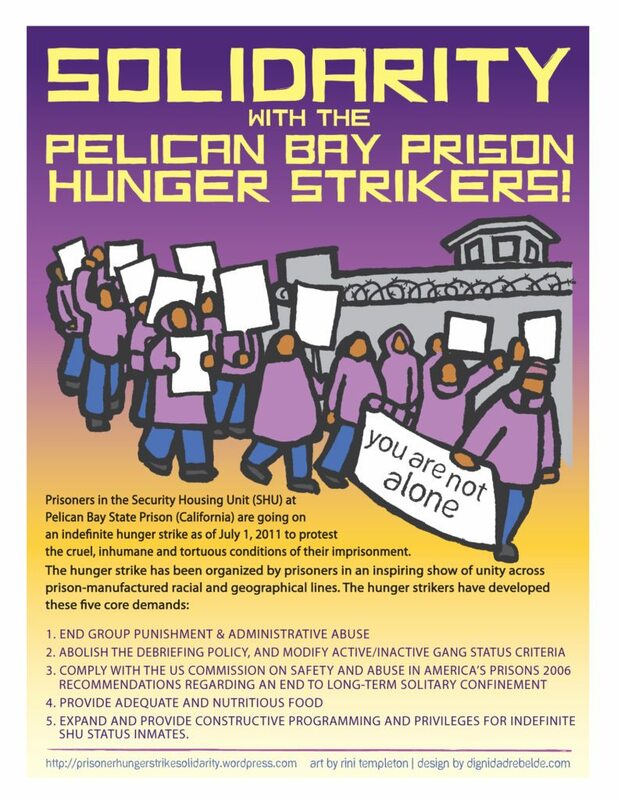 In the Spring of 2011, prisoners inside Pelican Bay State Prison contacted prisoner-rights and anti-prison activist organizations announcing 50-100 prisoners would be beginning a rolling hunger strike on July 1st, and that they needed support making sure their voices and demands were heard and acted on outside prison walls. The prisoners in the Security Housing Unit (SHU) at Pelican Bay State Prison (California), in July 2011, began what became an historic hunger strike to protest the cruel, inhumane and tortuous conditions of their imprisonment & to improve the treatment of SHU-status prisoners throughout California. At least 6,600 prisoners across the state of CA joined in solidarity with the Pelican Bay hunger strikers’ demands. After entering negotiations with the California Department of Corrections & Rehabilitation (CDCR) and refusing food for nearly four weeks, the prisoner hunger strike representatives at Pelican Bay’s SHU called for a stop to the hunger strike on July 20th to give the CDCR a few weeks to implement substantial changes to their policies & comply with the prisoners’ demands. The CDCR failed to follow through, so prisoners throughout the state resumed the hunger strike on Sept 26th, 2011. The strike was suspended again in October to give CDCR the chance to meet the demands; once again CDCR misrepresented its intentions and refused to meet the demands. Three times from 2011-2013, people locked throughout the CA prison system went on hunger strike to shed light on the solitary confinement tombs hidden from the public. They did this at great risk to their lives from organ failure, starvation, and violent retaliation from prison guards and administration. Two CA prisoners died during the hunger strikes. In 2012, some of the same prisoners, locked in extreme isolation, who organized the hunger strikes across racial and geographic lines, presented the Agreement to End Hostilities. It is an important, historic document that has been effectively uniting people inside the prisons and uniting people outside the prison walls, many whom have been divided by race and geography, to struggle for human rights together. The most recent hunger strike for the Five Demands lasted from July 8, 2013 to September 5, 2013 and involved over 30,000 people locked in CA prisons, as well as hundreds of other prisoners, young and old, throughout the United States. It was the largest hunger strike in history and brought the issue of solitary confinement to the attention of the media, legislators, the United Nations, and the public in general, resulting in legislative hearings, proposed (but failed) legislation, media attention, and solidarity actions both nationally and internationally. This courageous action falls within a long legacy of prisoner-led resistance throughout the world, including inside both men and women’s prisons in the US. As such, these struggles are connected to global struggles against inequality and powerlessness, for self-determination and liberation. 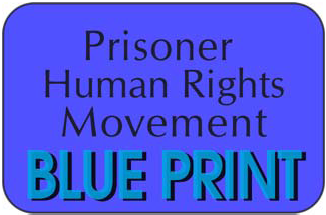 This blog is a place for updates on organizing efforts inside and outside prison regarding the Agreement to End Hostilities and the demands of the 2013 and 2011 strikes. It is also an archive from the hunger strikes, a location for research, history and analysis relevant to these actions, and a hub for updates on ways people can be in solidarity with the hunger strikers. Click here to sign the online petition to support the hunger strike! *Coalition partners include: Legal Services for Prisoners with Children, All of Us or None, California Families Against Solitary Confinement, Campaign to End the Death Penalty, California Prison Focus, Prison Activist Resource Center, Critical Resistance, Kersplebedeb, California Coalition for Women Prisoners, American Friends Service Committee, BarNone Arcata and a number of individuals throughout the United States and Canada. For more info on these organizations, visit our Resources page.